[Discontinued] funny, when a product excites me, I want to write forever. When a product bores me, well, not so much... in fact, I tend to wander off and go watch TV. However, I just got through watching the craziness that is "Salt", so let me pin down a few thoughts on Stonyfield Farms frozen yogurt. Let me start by saying this is the second pint of their froyo that I have purchased. Unfortunately, pint #1 was long forgotten in the deep freezer and has long since expired. I'm not even sure what flavor I bought, maybe vanilla. Sure, my wife eats their regular yogurt all the time, and we've had plenty of their organic milk, but for whatever reason... well, probably price... I never tried their froyo. Well, market basket has a pint for a mere $2.69 a container, so I think it's high time we get this stuff on the blog. Check out the stonyfield website if you are unfamiliar with their organic products. As you can see, I started off with one of three low fat varieties they currently have. 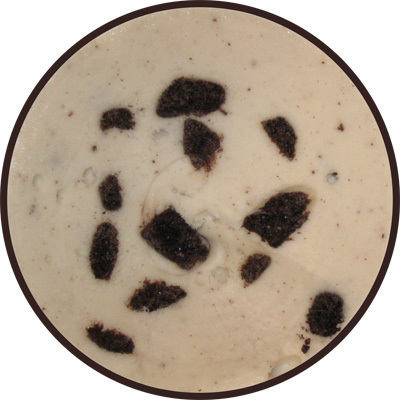 Cookies 'n Cream is creamy vanilla low fat frozen yogurt with chocolate wafers. The other low fat flavors are minty chocolate chip and creme caramel. 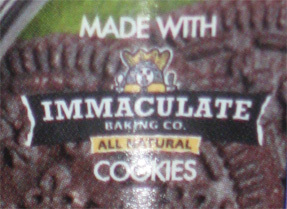 There is a tiny" made with Immaculate Baking Company All natural cookies" logo on the side. I frequently see the Immaculate ookie Dough hanging up next to the toll house and pillsbury cookie doughs, but we have yet to try them ... OH they make cinnamon roll dough too! Great, now I'm hungry again. You're excited by all the cookie chunks aren't you? This thing is crazy loaded with these things. They are literally everywhere, though you might also notice that there aren't a ton of tiny cookie flecks scattered throughout the treat (something I prefer in my cookies n cream, but no matter). I've got one more shot here for good measure. Notice the non-ice cream like texture of frozen yogurt. It's very... solid I guess you could say. It's very smooth, in an icy, watery kind of way. Can you guess where this is going? Sorry, but I do not like this froyo. I had really high hopes too. There are plenty of companies out there that can make a decent low fat froyo, yet in comes Stonyfield with this watered down treat. I just don't get it. It does seem like they were trying. It's organic and therefore doesn't have any nasty artificial tastes, in fact, it doesn't even really taste like frozen yogurt at all. It's definitely a step up from the fat free Breyers I had earlier in the week... well, small step up anyway. Wow, I'm so disappointed I don't even want to talk about it. This bad boy is going way down the list. 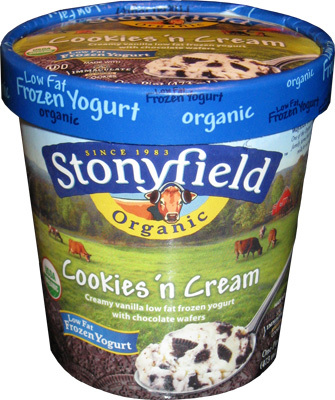 Stonyfield has good quality, and I see them trying, but at least Edy's and Kemp's don't taste watered down. In fact, none of them do, it's kind of why I'm in such shock here. All natural is important, but it's not everything. Just because something is healthy, doesn't mean it's going to taste good. Oh well. Maybe at some point they will tweak this little pint into something better. The ironic thing is that their regular ice cream has a really high fat content. Ice cream aside--you gotta try the Immaculate cookie dough. To die for! that overhead shot was honestly not appealing. at. all. For 130 calories per serving, this doesn't sound worth it. 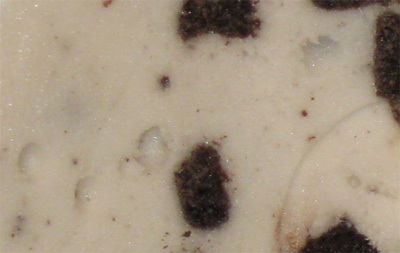 Breyer's Oreo frozen dairy dessert is 140 calories per serving and a respectable cookies and cream flavor. half the fat and twice the protein, not to mention it's organic versus non-natural frozen dairy dessert. if they did a better job of blending this flavor, it'd be decent.